As you know, May 3rd is a Friday school day, and it’s the Seniors’ last day of school, but it’s also the teacher/student volleyball tournament! High school students will be competing against each other and against the teachers!! Elementary, middle, and high school will be attending the tournament, and parents will be invited, as well. There will be music, games, and concessions, so don’t forget to bring some cash! Congratulations to BreAnn Morales, Maliyah Skipper, Malori Broussard, Mrs Kris Bonsall! 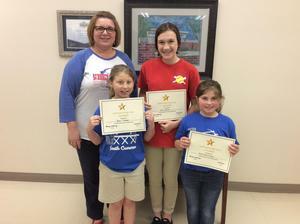 Congratulations to Harlow Smith, Brenlee Vincent, and Toni Kay Sibille! 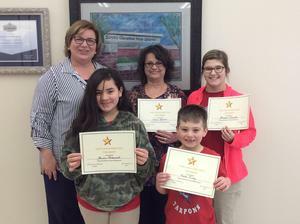 They have been chosen as Cameron Parish STAR winners! Congratulations to Rilee Bourriaque, Annie Trahan, Allie Hardie, and Mrs. Toni Kay Sibille! Congratulations to Kale King, Brilee Chaumont, Brenlee Vincent, and Mrs. Tina Savoie! Congratulations to Mrs. Lauren Baccigalopi, Lindsey Fontenot, and Jessica Richard! Our Early Learning Center, better knows as PreK-3 or Tarpon Tots, has earned the State Excellence Award! Congratulations to Grady Richard and Gauge LaBove! Congratulations to Eli Higgins, Grady Richard, Gauge LaBove, and Becky Trahan!